LISBON (the.ismaili) — Thousands of Ismailis from Jamats around the world have gathered in Lisbon, Portugal for the launch of an historic celebration, to mark the conclusion of Agha Khan’s Diamond Jubilee. 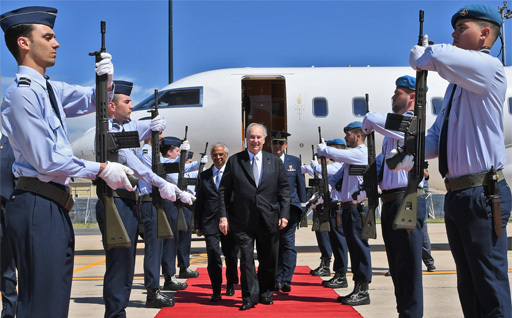 Aga Khan arrives in Lisbon, Portugal to Military Honours on the occasion of his Diamond Jubilee. The Diamond Jubilee marks the 60th anniversary of Aga Khan’s leadership as the 49th hereditary Imam (spiritual leader) of the Shia Ismaili Muslim Community. On 11th July, 1957, Aga Khan, at the age of 20, assumed the hereditary office of Imam, following the passing of his grandfather, Sir Sultan Mahomed Shah Aga Khan. A global Diamond Jubilee Festival is held in Lisbon over the days of July 5-11 2018, and will include two Jubilee concerts featuring world-renowned performers; an international Jamati Talent Showcase; an Art Gallery; a Film Festival, and a series of general celebrations. Jubilee concerts will be held with participation of performers such as Rahat Fateh Ali Khan, Salim Suleiman, Nobovar Chanorov, Cheb Khalid and Vishal Shekhar. At the Parque das Nações on the Lisbon seafront, hundreds of volunteers from numerous countries have been working to ensure the conclusion of the Diamond Jubilee year of Agha Khan, the leader of Ismaili faith. For Ismailis, Aga Khan is an Imam. The Imamat is the institution (office) of the Imam of the Shia Ismaili Muslims. In the Shia tradition of Islam, the Imamat is the hereditary institution of spiritual and moral authority. The Aga Khan Development Network is one of world’s most comprehensive development organizations. It operates in over 30 countries, principally in Central and South Asia, Eastern and Western Africa and the Middle East. The Network’s individual agencies have mandates ranging from health and education to rural development, microfinance, disaster reduction, the promotion of private-sector enterprise, architecture and the revitalisation of historic cities. AKDN spends $925 mln annually on non-profit social and cultural development activities and employs 80,000 people.